i.HOC Oil-Free Screw Compressors come with Sigma Control 2™ controller. i.HOC (Integrated Heat of Compression) Oil-Free Screw Compressors are equipped with variable speed radial blower used for compensating pressure loss during drying process. Units are available in CSG-2 and DSG-2 models that cover range from 50 to 250 HP. Compressor’s Sigma controller automatically adjusts to dynamic operating conditions and air demand fluctuations. Units can handle pressure dew point down to -40°F and feature small footprint. 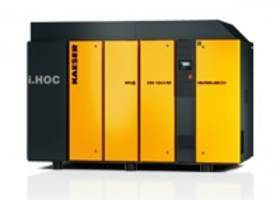 i.HOC integrated dryers are now available with Kaeser’s oil-free screw compressors. These energy-saving dryers handle pressure dew points down to -40°F. Available on both fixed and variable speed CSG-2 and DSG-2 models from 50 to 250 hp, i.HOC (integrated heat of compression) dryers use the heat that is a by-product of air compression to regenerate the desiccant without any additional heating energy to power the drying process. This ensures reliable air drying with maximum efficiency and lower energy costs - even when air demand varies. Additionally, i.HOC oil-free rotary screw compressors have a relatively small footprint without sacrificing serviceability. Unlike other systems, i.HOC takes advantage of all the available heat. As a result, the dryer reliably achieves low pressure dew points, even in demanding environments with low pressures, high temperatures, or low load operation. A high efficiency, variable speed radial blower compensates for any pressure lost in the drying process and automatically adapts to changing operating conditions. Full flow regeneration, together with an additional patented process, ensures dependable drying, without additional electrical heaters or coolers—even with ambient temperatures as high as 115°F. Furthermore, built-in heat recovery options give sustainable energy savings and contribute to lowering a plant’s carbon footprint. i.HOC units come standard with Sigma Control 2™. This intelligent controller manages the entire drying process, controlling the radial blower and drum drive of the dryer. Sigma Control 2 automatically adjusts to dynamic operating conditions and changes in air demand to maintain reliable and consistent pressure dew points. Additionally, it offers unsurpassed compressor control and monitoring with enhanced communications capabilities for seamless integration into plant control/monitoring systems and the Industrial Internet of Things (IIoT). For more information, visit www.kaesernews.com/ihoc. For more information or to be connected with your local authorized Kaeser representative, please call (877) 586-2691.